Scott, it's the stitching that needs protection from the battens, not the cloth. It's quite in order to have an unfinished edge of cloth inside a batten pocket. If you're doing your pockets according to Arne's method, I just don't see a problem at all. The Weathermax 80 that I used for a sailcover is not at all inclined to fray when scissor cut, so I don't suppose that Weathermax 65 is particularly vulnerable. Sooo - to save your night's sleep, all you have to do is to go for your own alternative #1. You are making good progress! I am planning to add 'pocket gap cover strips' near the luff and leach. 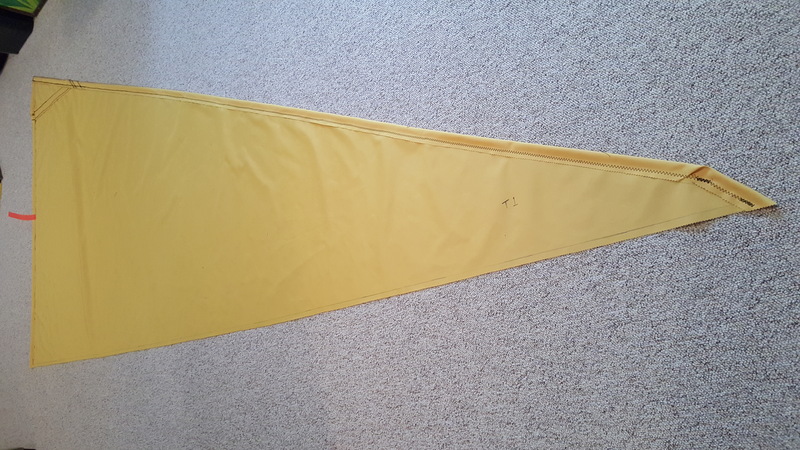 I am also planning to use 'marine vinyl' for batten pockets near the mast and the Weathermax 65 for pockets aft of the mast. The aft pockets will be cut with a hot knife. Even with everything above I think the battens in the pockets will wear on the raw fabric edge that was cut with pinking shears. When I used a sailcloth which needed to be fused (Broremann), I simply did all the cutting with a hot-knive. It souns to me that the fastes method would be to run a zig-zag seam along the raw edge. Why not fit batten pockets? They are quick to make, will protect the batten joining seam (plus most of that raw edge) and will speed the process of fitting the battens. Several times I found myself asking if the sail would be big enough. When it came time to stitch the upper and lower section together I stopped wondering. This is a substantial piece of cloth. I cut the cloth with pinking shears. 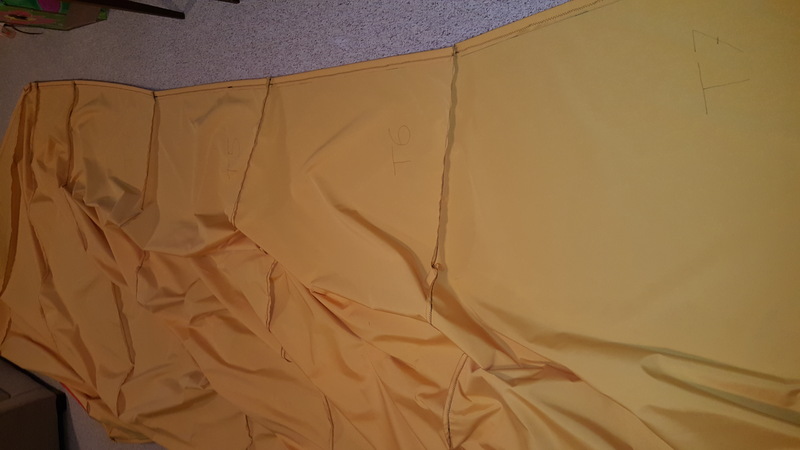 I do not think this will be a problem along the outside of the sail where I will have seatbelt webbing sewn over the raw edge. I expect it might be a good idea to do something else with the seams between the panels. 1. Overcasting the edges with a zig-zag stitch on the sewing machine. 2. Using a butane torch to singe the edges. 3. Using the hot-knife tip for my butane torch to cut just a few mm off each seam allowance. Does anyone have practical experience with fusing fabric at this point? I clearly missed the opportunity to do it right and use the hot knife while cutting out the panels. Arne, thank you for providing the specific alloy of your battens. And thanks to David for clearing up the pipe vs tube terminology. It looks like I need to use my own judgement to make a final decision on the battens. I have something that looks like panel 1 and 2 stitched together now. Joining fabric to make a wider cloth was just about as difficult as I imagined. Still aiming for 'strong and functional' and not a work of art. as you will have found out by now, I have not produced any hard rules or formulas about batten scantlings. That is because I find it too complex to produce any formulas. Instead, I record what I have used, how it worked and then try to interpolate or extrapolate to get the scantlings right on my next project. My guess is that the 25 x 2mm tubes would be fine on the lower battens of your boat. However, batten 2 from top should be of the 1.5” x 0.065”, as it takes a much higher load than the others. It might be an idea to use that dimension for the boom as well. One may be tempted to use the strongest dimension throughout. However, I have found that although these big-diameter-thin-wall battens are great for stiffness and strength, they also result in a quite bulky furled sail bundle, so moderation in all things. One more thing. You are using 6061-T6 alloy which has almost twice the yield strength of the 6060-T6 I use on my battens (I only use 6082-T6 on my masts), so I am pretty sure you will be fine. Thank you all for the responses. Graeme, the thread you started about mast height is very useful. I understood that halyard 'drift' was what I needed to consider but I was not sure exactly how to quantify it. I found a local metal supplier with a price that seems more reasonable. I am just about to commit some boat budget money to 1.5" OD 0.065" wall 6061-T6 aluminium tube. I think I am calculating the yield strength (is that the right term?) properly thanks to the newest chapter of TCPJR. But my formal education is in volts and amps and bits and bytes so there is a good chance I did something wrong. If someone could double check I would appreciate it. The sales person said they weigh about 5 lbs each. I think I am good to go. Any other thoughts? I think I am missing something fundamental. I see pipe listed as 6061-T6. How is 6061-T6 Pipe different than 6061-T6 Tube? Pipe is intended for carrying fluids, and is sized by its internal diameter. Tube is intended more for structural applications, and is sized by its external diameter. Pipe is also designated by its wall thickness (eg schedule 40, schedule 80), and the higher the pressure they are to handle, the thicker and heavier they are. Otherwise, size for size, they will be of the same strength, if the material and temper are the same.